When I was young we used to spend the summer with my great-aunt on our farm in Ohio. Twice a week the Milkman came past and delivered milk, ice cream and other dairy products. My great-aunt always let my sisters and me pick out a treat. Once a week the Breadman came past with his baked goodies. My great-aunt would take my sisters and me out to choose some special delicacy. Once every two or three weeks the Peddler came past. He drove an refurbished bus-type vehicle. We would climb up some steps he pulled out of the back door. Inside, on either side of the aisle, were shelves of all kinds of things. There were things for gardening, cooking, housecleaning, sewing, kids, and so on. If the Peddler did not have something that my great-aunt needed, he would promise to find it and bring it on his next visit. We girls were allowed to look everything over and pick out something special for each of us. We had a great time looking over the toys, games, candies, and other goodies that appealed to our young eyes. 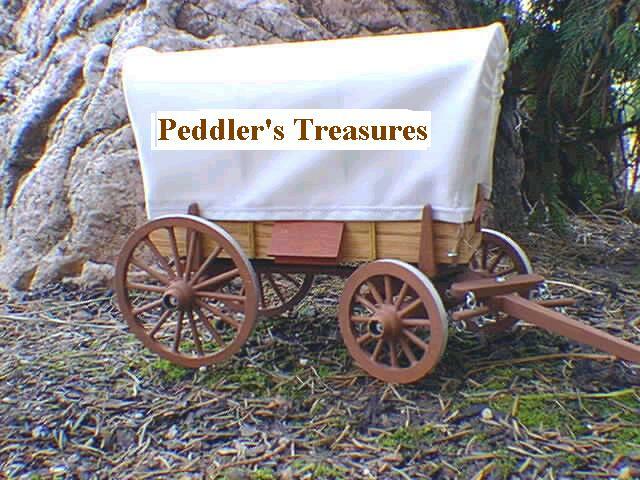 Although the years have come and gone, and the Peddler quit traveling the back roads of Ohio years ago, I have always held a dear spot in my memory bank of the variety of goods the Peddler always had with him, and the treasures one could find on his old traveling store. For that reason, I chose the name I have for my on-line store. It is my desire to provide a wide variety of goodies that will reach a bigger scope of people's needs. If you do not find something you would like to purchase on-line, feel free to contact me, and I will see what I can do.